In 1984, a film that would change the face of cinematic horror was released to unsuspecting audiences, entitled A Nightmare on Elm Street. Its success would spawn numerous sequels and even an entire film studio. Now 26 years later, New Line Cinema in association with Platinum Dunes brings a revised vision of the original back for a new generation of movie audiences. Film viewers expecting an exact remake of the beloved original will be disappointed as Director, Samuel Bayer, creates a fresh take on the original film. Gone are all the wisecracks and black humor from the sequels as Bayer tries to take us back to a place of horror that made people afraid to fall asleep in 1984 -- just as Jaws made people afraid to enter the ocean. A fresh group of young actors have been brought in the play -- the children of Elm Street, including Rooney Mara (Social Network, Girl with the Dragon Tattoo), Kyle Gallner (Smallville, Jenifer's Body), Thomas Dekker (Terminator: The Sarah Connor Chronicles), Kellan Lutz(90210, Twilight), Katie Cassidy (Supernatural, Melrose Place). Other than a few nods to the original, A Nightmare on Elm Street, their performances are perfect and stand on their own right without relying on being word-from-word of the original cast. The nightmare scenes in the film are dead on -- probably the best one ever put to film and not just because of the fact that technology has advanced so much since last time we saw Freddy Krugger on the screen. However, this is where one point of contention has come in with most fans, including this reviewer -- the portrayal of Freddy Kruger himself. While Jackie Earle Haley does an amazing job bringing one of the most iconic horror characters to life, it just seems to lack something. It really isn't something you can but your finger on, but in all honesty, he just is not Robert Englund. While I can respect the creator of the new Nightmare wanting to have a fresh start. Since Robert Englund is more than just a "guy in a hockey mask", it is pretty hard to replace his amazing performances throughout the years. Saying this, Jackie Earle Haley's performance is not horrible in the least; actually it is amazing. It just does not feel like Freddy Kruger, including this speaking mannerisms, and the way he moves on screen. 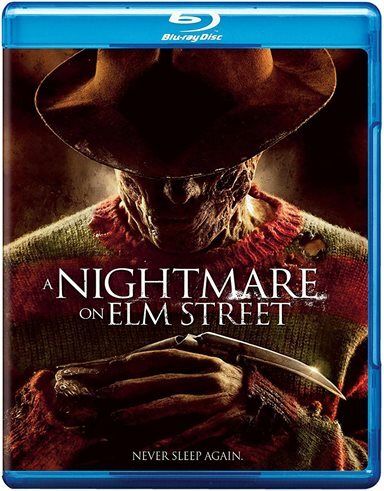 The Blu-ray disc combo pack comes with every available medium for film lovers to enjoy their new Nightmare on Elm Street fix including a Blu-ray disc of the film, a DVD copy, and a Digital copy to take on the road (or to stream to your brand new Apple TV). The picture quality and audio is simply amazing, allowing you to completely immerse yourself in Elm Street the way the original was not able to accomplish, even on Blu-ray. Other than that, the special features themselves on the disc were pretty sparse. Included was the standard making of fluff, and very few deleted scenes (in fact some scenes from the theatrical and making of are curiously absent from this section). If there was ever a way to re-create A Nightmare on Elm Street, fans should be happy that this team was picked. It is smart, clever, has a great breadth of fresh air at a time that horror movies have "jumped the shark". However, in my heart, no one can replace the original Fred Kruger. Download A Nightmare on Elm Street from the iTunes Store in Digial HD. For more information about A Nightmare on Elm Street visit the FlickDirect Movie Database.